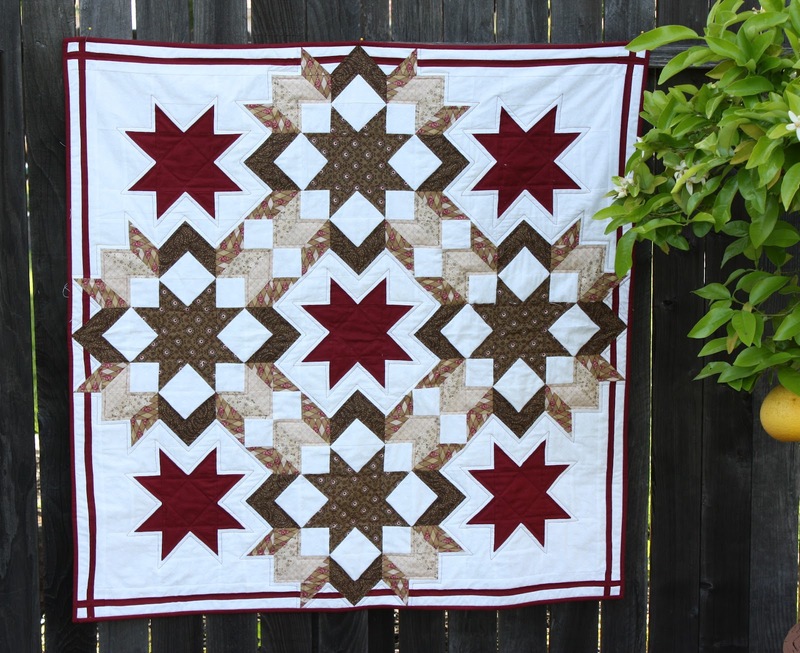 #1202 - Southern Belle - a table topper/wall hanging inspired by some of the fabulous Carpenter Star blocks I've seen. I love this pattern so much, I'll be doing a full-sized quilt pattern too!! April AYOS - Summer Day - this one will probably be a table topper size, rather than the quilt. We'll see! My own version of Patchwork Posies in Ruby by Bonnie and Camille - just have to add a top and bottom border and then I'm done! 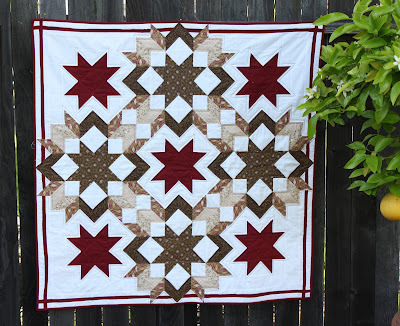 Jewel Stars English Paper piecing - loves these, but man do they take awhile to put together! #0909 - Spring Has Sprung - this one is almost done! Fabric: The coral print is from Lovely by Sandy Gervais for Moda and the yellow is a quilt shop batik. Pattern: Full House Schnibble by Miss Rosie's Quilt Co. Fabric: Assorted pink and white prints from JoAnns. Fabric: The coral print is from Lovely by Sandy Gervais for Moda, the yellow is a quilt shop batik, and the white and green are stash prints from JoAnns. Pattern: None - was just playing around with prairie points on a rainy Monday. Fabric: A fat quarter stack with no print information from JoAnns. Pattern: inspired by Bibelot by Miss Rosie's Quilt Co. for AYOS. Fabric: Daisy Kingdom Farm from JoAnns. Pattern: None - gotta love that pre-pieced top!